Because Paul and I had never sailed before we decided to sail around the world, we didn't know what boat we should consider buying. 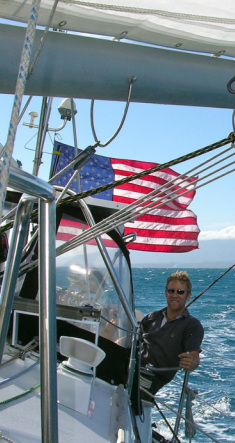 My dad, who had sailed on the Chesapeake Bay for several years, told us that we would need a blue-water or cruising sailboat. He favored Valiant sailboats as this make had completed more circumnavigation than any other brand which seemed to indicate that they were safe boats. After checking out the beautiful - and expensive! - boats at the Annapolis Boat Show, Paul and I started looking for a used Valiant. We found one we liked in Florida online and placed an offer to buy her, sight unseen, but contingent upon our approval once we actually saw the boat. We flew down one weekend and discovered that her hull was covered in a rash of tiny blisters in her fiberglass. It didn't bode well. And after we went on board, I was dismayed to find that Paul and I would not be able to sit up in bed as the ceiling was too low. How would I drink coffee in bed in the morning? As silly as that may sound, we were shopping for more than just a boat, we were shopping for our home for the next several years. We retracted our offer and broadened our search to include Tayanas, some of which shared the same boat designer as the Valiants we were looking at. We found Cherokee Rose online as well and flew down to Beaufort, SC, to see her. 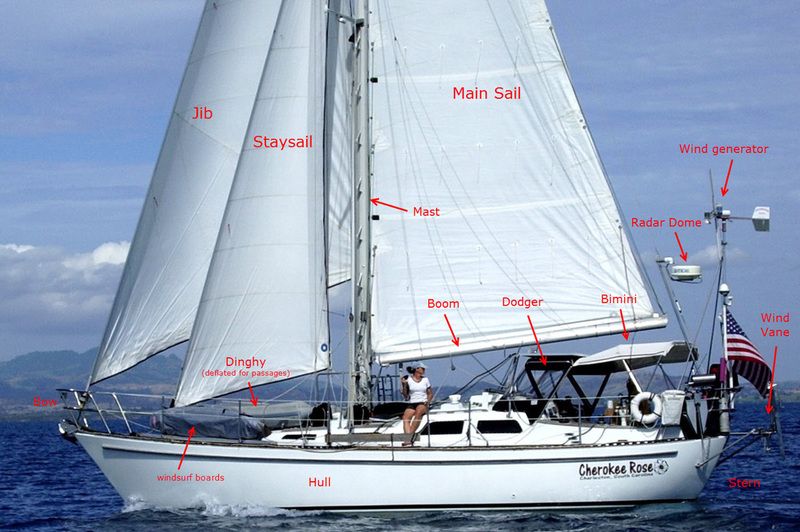 Despite her tired exterior, the sailboat was well-equipped for cruising (see specs below). We placed an offer, contingent upon an acceptible boat survey (the marine version of a pre-purchase home inspection) and engine test. Both came back positive. Best of all, she had tons of lockers without feeling claustrophobic. And yes, I could sit in bed and drink a cup of coffee...which I did whenever we were anchored (and the boat was level). Kelly sits on the deck of their cruising sailboat Cherokee Rose as they cruise in Fiji. 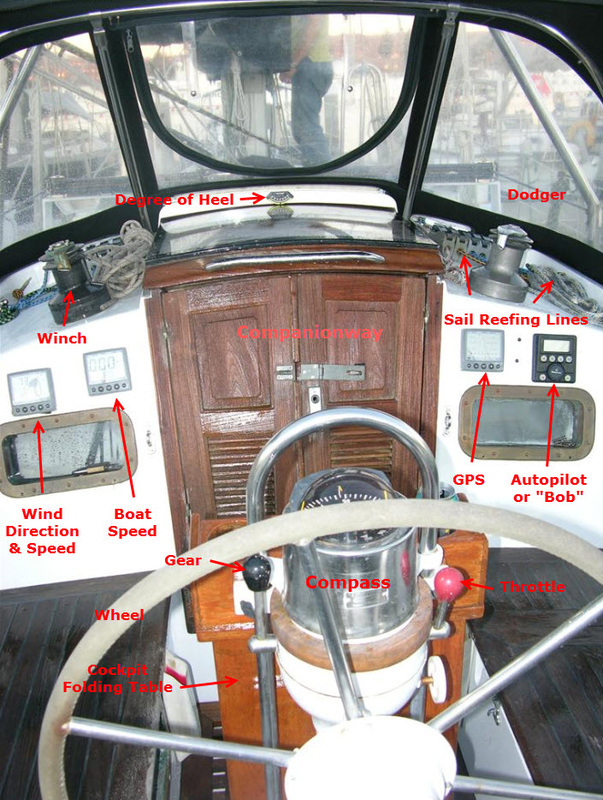 Photo labelled with common sailing terms. Photo taken by s/y Hannikin. The cockpit of Cherokee Rose as seen from behind the wheel. Note that these tidy interior photos of Rosie were taken at the end of our cruise, after we painted and worked on her interior. As the numerous other photos on this website clearly show, we always seemed to be in a state of disarray while living aboard. Large quarter berth on port side under cockpit; immediately forward of quarter berth is a wet hanging locker. Forward of the locker is the nav station across from which is the U-shaped galley. Forward and down 2 steps is the main salon which features a settee and pilot berth on the port side; on the starboard side is a L-shaped settee and table. A short passageway connects the main salon with the forward cabin. One side of the passageway houses 5 drawers and a Bendix combination washer/dryer. The head, with 5 large storage lockers, is on the other side. The forward cabin has a Pullman-type berth, with real mattress, to port and a credenza with storage to starboard. Forward of the cabin is a large storage locker with a water-tight hatch leading to the chain locker. *Note: We interfaced our Robertson autopilot, Silva instruments and Garmin GPS to our electronic charts on the Dell computer. We were able to plot our course on our electronic charts, have the waypoints transmitted to our GPS and have our autopilot steer the boat to our course. The autopilot beeped to let us know if a course change was occurring so we could prepare the sails. In addition, we were able to see depth, wind speed, speed over ground, etc on our computer – so the nav station really served as another “command” center. If interested, ask Paul how he set this up and about our electronic charts. **We chose Inmarsat C over satellite phones for three reasons: Inmarsat C sends free weather updates four times a day and the weather forecast is based on your current GPS location – a perfect, and easy, compliment to downloading weather faxes via the SSB (yes, Rosie has that capability, too) and more reliable since it is not subject to atmospheric variances like the SSB. Second, the Inmarsat C gave us another level of safety. Our families could monitor our progress on www.purplefinder.com, a website used primarily by shipping companies to track their fleet but it also works great for sailboats – showing where Cherokee Rose is and giving details like wind speed and speed-over-ground. In addition, the Inmarsat C operates like another Epirb in case of an emergency. By pressing two buttons simultaneously, it sends out a satellite distress call with GPS location. Lastly, when something breaks at sea (as it does), we were able to get information/instructions e-mailed to us so we could fix the problem.